Lebanon Valley College is committed to supporting all military students and those using military education benefits. Most degree granting programs offered at Lebanon Valley College are approved by the Veterans Administration (VA), as well as select study abroad, certificate programs, and professional studies programs. Students may also receive their benefits while participating in internship placements. It’s easy, and there’s no application fee. Give us a little bit of your time now— and we’ll give you our full support and attention throughout your college experience. Click on the links below to apply to Lebanon Valley College! What military education benefit am I eligible to receive? Pennsylvania National Guard Education Assistance Program (EAP) - To apply for EAP, visit PHEAA. Federal Tuition Assistance (FTA) - To apply for FTA, visit GoArmyEd or see the Education Services Official within your unit. How can I use my benefit at LVC? Click here for the military education benefit step-by-step checklist. Does LVC participate in the Yellow Ribbon Program? Yes, LVC does participate in the Yellow Ribbon Program. For the 2017-2018 Academic year, Lebanon Valley College will not limit the number of Yellow Ribbon eligible and LVC accepted undergraduate students into the Yellow Ribbon Program. For more information regarding the Yellow Ribbon Program, click here. What scholarships can I apply for? To be considered for institutional, federal and state financial aid, submit your FAFSA and view additional scholarship opportunities here. For a list of outside scholarships specifically for Veterans or dependents of Veterans, click here. How will my military benefit impact my financial aid? The College reserves the right to decrease any institutional aid (grants/scholarships) if the sum of the veteran's benefits paid directly to the school exceeds the amount charged for tuition and fees. 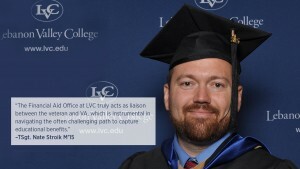 The College reserves the right to decrease institutional aid that is awarded based on need if the sum of the institutional need-based aid AND the veteran's benefits paid directly to LVC exceeds the student's financial need as determined by the FAFSA. The student's non-need-based scholarship will NOT be adjusted through this portion of the policy. The Department of Veterans Affairs (DVA) may, at their discretion, reduce a student’s anticipated Post-9/11 GI Bill® payment to Lebanon Valley College for tuition and fees in order to satisfy a student’s outstanding debt (of any kind) with DVA. Students are responsible for any balance due to the College as a result of a reduced Post-9/11 GI Bill® payment. The Lebanon Valley College Military Scholars Tuition Reduction Program is available to Veterans (whose discharge is other than dishonorable) and current Servicemembers on Active Duty or serving as reservists. This program is offered only to enrolled part-time undergraduate students or Master's level graduate students enrolled in the MBA program. The program is not open to dependents of Veterans or to full-time undergraduate students or to students of any other graduate program. The tuition will be set at a rate of $485 per credit for the 2018-2019 academic year and will be re-evaluated each year.